Declared redundant in 1994, Langport church is in the care of a conservation trust and is open to visitors. On the wall inside the west door there is a framed timeline from the Edwardian era. 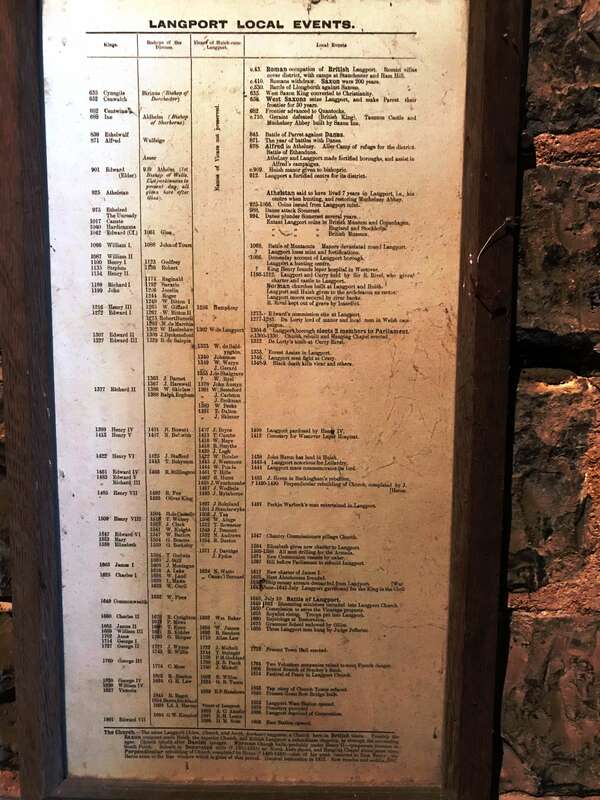 Titled “Langport Local Events”, it lists the bishops of the diocese and priests of the parish and provides a history of the town. c. 43 Roman occupation of British Langport. Roman villas cover district, with camps at Stanchester and Ham Hill. c.530 Battle of Llongborth against Saxons. 635 West Saxon King converted to Christianity. 654 West Saxons seize Langport, and make Parret their frontier for 50 years. 682 Frontier advanced to Quantocks. c.710 Geraint defeated (British King). Taunton Castle and Muchelney Abbey built by Saxon Ine. 845 Battle of Parret against Danes. 871 The year of battles with Danes. 878 Alfred in Athelney. Aller Camp of refuge for the district. Battle of Ethandune. Athelney and Langport made fortified boroughs, and assist in Alfred’s campaigns. 912 Langport a fortified centre for its district. Athelstan said to have lived 7 years in Langport, i.e., his centre when hunting, and restoring Muchelney Abbey. 925-1066 Coins issued from Langport mint. 994 Danes plunder Somerset several years. 1068 Battle of Montacute. Manors devastated round Langport. Langport loses mint and fortifications. 1086 Domesday account of Langport borough. Langport a hunting centre. King Henry founds leper hospital in Westover. 1166-1212 Langport and Curry held by Sir R. Rivel, who gives charter and castle to Langport. Norman man churches built at Langport and Huish. Langport and Huish given to the archdeacon as rector. Langport moors secured by river banks. R. Rivel kept out of grave by Interdict. 1273 Edward’s commission sits at Langport. 1277-1233 De Lorty lord of manor and local men in Welsh campaigns. 1304-6 Langport borough elects 2 members to Parliament. c.1300-1330 Church rebuilt and Hanging Chapel erected. 1322 De Lorty’s tomb at Curry Rivel. 1333 Forest Assize in Langport. 1346 Langport men fight at Crecy. 1348-9 Black death kills vicar and others. 1400 Langport pardoned by Henry IV. 1412 Cemetery for Westover Leper Hospital. 1438 John Heron has land in Huish. 1443-4 Langport notorious for Lollardry. 1444 Langport mace commemorates its lord. 1483 J. Heron in Buckingham’s rebellion. 1460-1490 Perpendicular rebuilding of Church, completed by J. Heron. 1491 Perkin Warbeck’s men entertained in Langport. 1547 Chantry Commissioners pillage Church. 1564 Elizabeth gives new charter to Langport. 1569-1588 All men drilling for the Armada. 1571 New Communion vessels by order. 1597 Bill before Parliament to rebuild Langport. 1617 New charter of James I. 1645 July 10 Battle of Langport. 1662 Dissenting ministers intruded into Langport Church. 1650 Commission to seize the Vicarage property. 1655 Royalist rising. Troops put into Langport. 1732 Present Town Hall erected. 1806 Bristol Branch of Stuckey’s Bank. 1814 Festival of Peace in Langport Church. 1840 Present Great Bow Bridge built. 1863 Langport West Station opened. 1886 Langport deprived of Corporation. I wonder how long the church was going downhill before the bullet was finally bit in ’94. I expect like here with the Catholic church it was only a matter of time for after the 60s the young then -70 plus now- simply stopped going. And like here in the census will still say they are CoE. Or did some evangelising minister come through at some point. R. Rivel kept out of grave by Interdict. What’s this ?. Langport was always a tiny parish, surrounded by Huish Episcopi, the church of which stood only a couple of hundred yards away. But the CofE has been in terminal decline since the 19th Century, identification with it owes much more to cultural than theological factors.